Even if you usually make your oats with a mixture of milk and water, cook oats in your slow cooker with water alone or you'll risk the milk curdling overnight. Stirring a little milk through at the end and serving with yoghurt will give you the creaminess you're looking for. 1. Grease the inside of your slow cooker with a little butter, reserving the rest for serving. 2. Stir the oats, salt and 4 four cups of water into the slow cooker and cook on low for seven to eight hours. Set the oats to cook before you go to bed and wake up to warm porridge in the morning. 3. Add the milk and stir briskly, adjusting the consistency if necessary. Allow to stand in the cooker for 10 minutes before serving. 4. Place a portion of the porridge into a bowl and top with a teaspoon of butter, letting it melt. 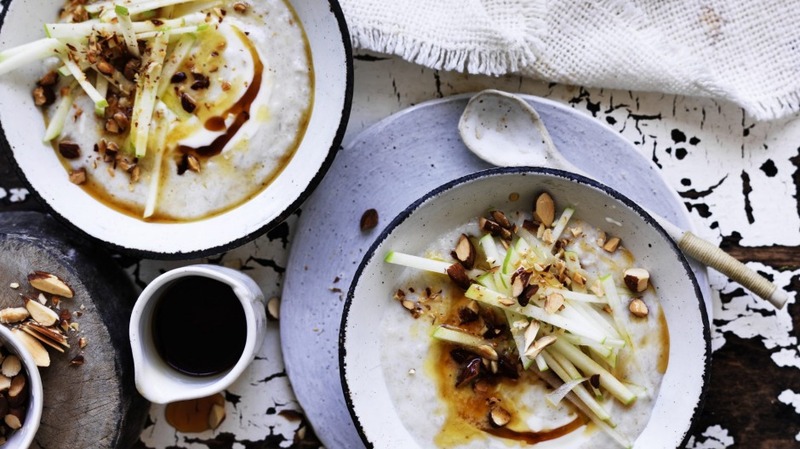 Top the porridge with the apple, almonds and yoghurt and drizzle over as much maple syrup as you like.